Friday, August 3, 2018. My journey began. I will go to Philippines with two other students from Falucty of Teacher Training and Education, Sebelas Maret University (UNS). They were Rista Tiana from Primary School Education Major and Ristya Cahyani from Economics Education Major. We were scheduled to fly at 6.10 a.m from Adi Soemarmo Airport (Surakarta) to Jakarta. My parents drove me to the airport. Rista, Ristya, and their parents already arrived in the airport. Our parent were crying because it was our first time to go to overseas. Ouchh… my tears couldn’t be absolved. I wasn’t ready to leave my parents. When we already checked in, suddenly there was a announcement that our flight was delayed. Oh my god. 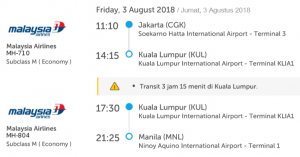 We were afraid if we would be late for the next flight because we had to go from Jakarta to Malaysia at 11.10 a.m. (FYI, we would transit in Malaysia). Our first flight was delayed for 2 hours. We thought that we wouldn’t be late. But, our flight was delayed for one hour again. Finally, at 9.15 a.m. we took off, and we knew that we would be late. 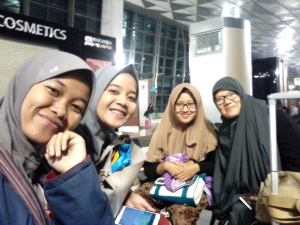 We arrived at Terminal 1, Soekarno-Hatta Airport at 10.50 a.m. but, we had to go to Terminal 3 (International Departure) to check in. Before that, we had to take our baggage. When we arrived at Terminal 3, we saw that our plane departure. Oh my God, we were be late. We were so sad. 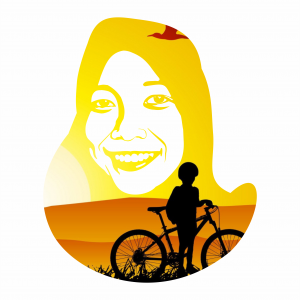 Then, we contacted our coordinator of UNS, Mrs. Nurma and also contacted Mrs. Imelda. Then, we had to reschedule our flight. We would go on the next day. So, we slept at the airport. Oh… be strong girls. But, don’t worry. We met with someone from Malaysia, she was Mrs. Anna. She like our mom for our journey from Jakarta to Kuala Lumpur. She was panic when we told her about our problem. We had a new bad news that our names weren’t on the passenger list of MH726. What the hell !! Hehehehehe… But, we already finished our problems before our departure. We took off at 04.25 a.m and arrived at 07.25 a.m. in Kuala Lumpur International Airport. Then, we went on a journey from Kuala Lumpur to Manila. We arrived in Ninoy Aquino Intenational Airport at 2.05 p.m., August 4, 2018. Mrs. Eduardo was waiting for us. And then, we ate burger KFC in SM Mall of Asia. After that, I was so sleepy, so I slept for few hours on the way. I was awakened from my sleep to dinner at Max’s Restaurant. We ate chicken sisig. 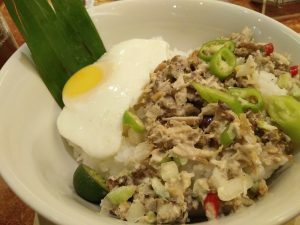 The taste of chicken sisig was very delicious. Yummy…. Very tasty! Then, I slept on the way from Manila to BSU and we arrived in guest house of BSU at 1.45 a.m, August 5, 2018. That was time that all of students from Indonesia were sleeping.